The validity of the Malnutrition Screening Tool (MST) in geriatric rehabilitation has been evaluated in a research environment but not in professional practice. In older adults admitted to rehabilitation, this study was undertaken to compare the MST scoring agreement (inter-rater reliability) between health professionals with and without malnutrition risk and screening training; to evaluate the concurrent validity of the MST completed by the trained and untrained health professionals compared to the International Classification of Diseases, Tenth Revision, Australian Modification using different MST score cutoffs; and to determine whether patient characteristics were associated with MST scoring accuracy when completed by health professionals without malnutrition risk and screening training. DESIGN: This was an observational, cross-sectional study. Fifty-seven older adults (mean age=79.1±7.3 years) were recruited from August 2013 to February 2014 from two rural rehabilitation units in New South Wales, Australia. 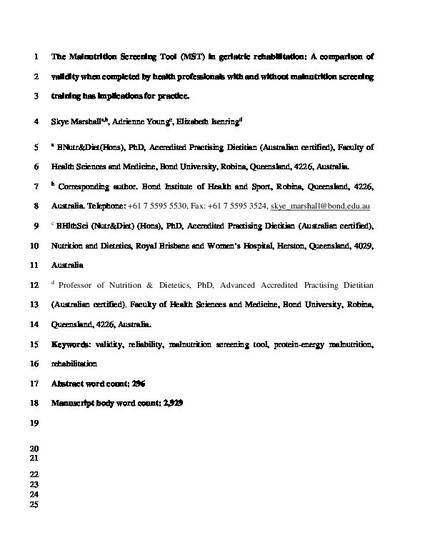 MST, International Classification of Diseases, Tenth Revision, Australian Modification, classification of malnutrition, and patient characteristics were used to measure outcomes. Measures of diagnostic accuracy generated from a contingency table, receiver operating characteristic curve, and Spearman's correlation were used. The MST scores completed by health professionals with and without malnutrition risk and screening training showed moderate correlation and fair agreement (rs=0.465; P=0.001; κ=0.297; P=0.028). When compared to the International Classification of Diseases, Tenth Revision, Australian Modification, the untrained MST administration showed moderate diagnostic accuracy (sensitivity 56.5%, specificity 83.3%), but increasing the MST score to ≥3 caused the sensitivity of both the trained and untrained MST administration to decrease (56.5% and 22.9%, respectively). The application of the MST by health professionals without malnutrition risk and screening training in rehabilitation may not provide sufficient accuracy in identifying patients with malnutrition risk. Using an MST score of ≥2 to indicate malnutrition risk is recommended, as increasing the MST cutoff score to ≥3 is likely to have insufficient accuracy, even when completed by health professionals with malnutrition risk and screening training. Research evaluating the impact of providing rehabilitation staff with regular and ongoing training in completing malnutrition screening and referral pathways is warranted.